Ananka's Diary: Why Can't You Find a Bear When You Need One? Helen and Jerry Stathatos have a bit of a problem. They live in a lovely California home surrounded by beautiful gardens. Gardens that have attracted bees--lots and lots of bees. For years, the humans and insects have coexisted peacefully. 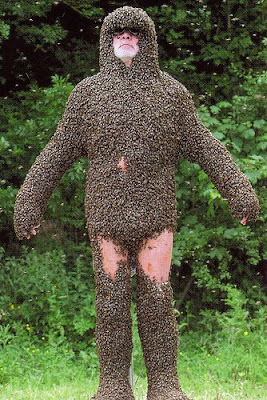 But in the last few months, the bees have gotten a little out of control. Seems thousands (if not millions) of bees made their homes inside the walls of the Stathatos's home. And now they're producing honey. Gallons and gallons and gallons of honey. The sticky substance has even started oozing out of the walls and dripping down the wallpaper. According to one bee expert, "You walk into the house and it smells sweet. I felt like I was in a jar of honey." To add insult to injury, the owners can't even get to the delicious honey without knocking down their own walls! hurry, I need a cute post!! Yuck... honey is bee vomit! The picture is definitely freaky. YUCK! that's creepy and sad, what have they done to the bees!? nothing! anonymus 2 is right. that is sad. But, at least they don't need air freshener! :D Jin Ai also needs a good dose of grossness. (no offense) Ppl being squeamish is one of my pet peeves! uuummmmm... is that guy wearing anything BUT bees?!?! GAH! that's the most disgusting pic I've ever seen.